Erlewine First, are you willing to share your birth data with our readers and if so, please tell us what it is. Forrest: January 6, 1949. 3:22AM. Mt Vernon, NY (Westchester County). That should give you a little over 22 degrees of Scorpio on the Ascendant. Erlewine How did you get interested in astrology? Forrest: Two lines converged. My first memory as a child was wanting a telescope. By the time I was twelve or so, I was an active amateur astronomer. The second line was palmistry, which I learned from a German girl when I was thirteen. These two lines of interest developed quite independently in me until I was seventeen, whereupon I asked for my first astrology book and the two perspectives fused: a sense of the luminosity of the starry night that came from gazing through telescopes met the ancient psychology implicit in palmistry. 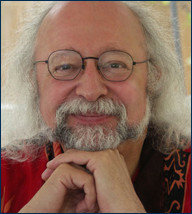 Erlewine Who did you learn from, what books or schools of astrology? Forrest: Strictly from books. I didn’t even meet another professional astrologer until after I had published two successful astrology books with Bantam. That’s Saturn on the Midheaven for you! The authors who spoke to me most deeply were the English theosophical crowd - Charles E.O. Carter and Ronald Davison stand out most vividly. I was also influenced enormously by the book, “The Theory of Celestial Influence,” by Rodney Colin. Erlewine Have you had teachers or mentors and, if so, who are they and tell us something about their influence. Is there a sense of any lineage in your astrological education? Forrest: Not in the astrological world at all, sad to say. But I feel lineage vividly through Vajrayana Buddhism and the Edgar Cayce “psychic” traditions - not that I think of myself as psychic, but rather that tradition of viewing the world in terms of spiritual evolution over many lifetimes. I have spent a lot of face time with people whom I view as masters in both traditions. I also had a personal spiritual teacher when I was in my twenties who had a profound impact on me - Marian Starnes, a classic wise woman. She was my spiritual mother. I will always honor her. Erlewine What type of astrology do you do? What techniques do you use and what techniques really work for you? Forrest: I practice Evolutionary Astrology, which is essentially the collision of ancient metaphysics and a Jungian style of personal psychology. The technique is essentially an effort to discern unresolved prior-life dynamics and to see how they impact the present, psychological experience of the chart. The aim is of course not “prediction” or “delineation,” but rather healing and release. For a look at the actual techniques, see my book “Yesterday’s Sky: Astrology and Reincarnation.” It really takes three hundred pages to describe them fully. Erlewine Have you created any new techniques in astrology and what are they? Do others know about and use them also? Forrest: I’ve added quite a lot to the arsenal of tools and interpretive strategies in Evolutionary Astrology - again, see my book, Yesterday’s Sky, for details. I’ve also been running an astrological Apprenticeship Program focusing on these techniques for ten years or so. About four hundred people have passed through it, so yes, definitely many others are using these techniques to good effect. I am proud of the number of my students who have made the transition to full-time astrological practice. These methodologies are robust and unlike much of what one might learn at an astrology conference, they actually pass the test of functioning usefully in real life. When astrologers hear that Evolutionary Astrology is about reincarnation, they often react as if it must all be woo-woo. Actually it is a very hard-hitting form of psychological astrology: intense, but compassionate. And imminently verifiable in the present-tense of people’s lives. Erlewine What do you personally use astrology for in your life and how often do you consult it? Forrest: I try to keep a sense of the big developmental transits-and-progressions themes in my life and to reflect upon them. I often find myself going for a walk and kind of talking to myself in my head, doing the “spiel” that I would use for a client under the same astrological circumstances. I invariably marvel at the squirmy impact the words have on me! This stuff is powerful. It takes me aback sometimes. Also, I am very aware on a day to day basis of the condition of the Moon, always timing any significant action on my part with it - things like signing contracts, booking airline flights, initiating momentous professional moves, and so forth. I never do any of that without consulting the Moon, making sure it is not Void of course and that its last aspect will be a gentle one. Erlewine Have you done readings for others? If so, what techniques work best and how often do you do readings? Do you want clients to contact you now for readings? Forrest: I have made my living as a professional counseling astrologer since 1978. My readings are long - typically 2.5 - 3 hours - so I typically do only two per day, morning and afternoon, Monday through Friday. I don’t take many vacations. I have been at it full-time for thirty years and several years before that on an active part-time basis. My schedule is always maxed out. You can do the math about how many clients I’ve seen. I am still at it and I am always open to working with new people. Erlewine Have you been to gatherings, conferences, etc. on astrology and how were they? Are you a social astrologer or a lone wolf? Forrest: The first part of your question is the easy one to answer. I have spoken at countless astrological conferences. I personally do not generally find them very useful or meaningful except for networking purposes. The short format of the talks compels a non-integrative, specialized approach to astrology which tends not to work well when you try to apply it in practice with clients. The second part of your question is the toughie. I would say that I am a lone wolf living the life of a social astrologer. I feel a moral, ethical need to relate to the community, and doing so also serves practical career-oriented purposes. But I am really happiest with human beings one or two at a time. Conferences overwhelm me, in all honesty. I am not comfortable in that context. .
Erlewine What are your connections to professional astrologers? Do you belong to any astrological organizations? Forrest: I belong to ISAR and NCGR. I served for a quite a while on the ISAR Ethics Committee. I am proud of that. Basically, I helped write the ISAR Code of Ethics. I am on the board of advisors to NCGR. I have been the chair of the Advisory Counsel for Kepler College for many years now too, although that role is really only a nominal one. They’ve never taken any of my advice! Erlewine What are your thoughts about the state of modern astrology and astrologers? Forrest: We are in a messy time as a community. What has happened is that astrology has opened up like a flower, with each petal going in a different direction. There are now so many active styles and traditions – Evolutionary, Psychological, Jyotish, Renaissance, Hellenistic, Heliocentric, Cosmobiology, Uranian, Mayan, along with asteroids, midpoints, trans-Neptunians, harmonics. On one hand, this is great – let’s celebrate diversity! On the other hand, it has created a perfect Tower of Babel phenomenon, where astrologers no longer speak a common language. We can hardly even argue intelligently any longer! And that leaves two choices: not arguing and arguing stupidly. The latter seems popular. Erlewine What about the business of astrology? Does it work for you? How much of your income comes from astrology in percentages? Forrest: Since 1978, I have made 100% of my income from astrology. Jodie and I have no family money to speak of, and no other source of income. I’ve done fine, earning about what a good, industrious psychotherapist would earn. Most of it comes directly from client work. I also teach and write and make some money in the form of royalties from the report writers Jodie and I have created. We have a beautiful home in the desert of southern California and we still own our place in North Carolina. I could retire fairly comfortably in my early seventies, although I doubt I would want to do that. This work pays a lot more than mere money! Boasting about one’s income seems like the height of crassness and folly. On the other hand, I feel the single most helpful thing modern astrologers can do for our field is to publicize the radical idea that astrology is actually a legitimate profession - that you can support yourself with it. You can make a decent, middle class living in the field if you offer the kind of astrology that is meaningful to people outside the tiny, insular, ingrown world of technical astrology. If that fact were widely understood by the general populace, it would be an enormous, healthy change for the astrological community. Money is the main route out of any ghetto. Astrology is a ghetto, and it should not be that way. We have to overcome this “spiritual” taboo against speaking of nitty-gritty professional realities in our field. Financial realities. I have been appalled at the number of famous astrologers who can’t seem to make a living at it. What’s going on there? There are several legitimate perspectives on that question, but certainly potential students have a right to wonder about the efficacy of what these people are teaching. If you practice a kind of astrology that is actually helpful and meaningful, you will have no trouble attracting enough clients to support yourself. Word of mouth in your community takes care of that, if you stick with it for a while. Erlewine Tell us about your business astrology projects. Forrest: Jodie really runs most of that side of things. She started “Seven Paws Press” to self-publish a fantasy novel she got tired of trying to market to the mainstream press. That project was eye-openingly successful, so we began publishing astrology books too. At this point, it is strictly about our own books, although in the past we did publish a couple books I co-authored with Jeff Green and also a big book project edited by Rafael Nasser - “Under One Sky.” That was a great experience, by the way. There were a dozen astrologers, each representing a different tradition. Rafi gave each of us a woman’s birth data and some money and just said, “have at it, show me what you’ve got.”. We all wrote our interpretations as best we could, doing nothing but 100% pure astrology - we knew nothing at all about the woman. Even her name was false. It was such a fabulous put-up-or-shut-up moment! In the end, Rafi wasn’t able to find a publisher for the manuscript, so Jodie took it on as a Seven Paws Press project. Blowing my own horn a bit here, Chris Lorenz, reviewing “Under One Sky” in Dell HOROSCOPE, wrote, “As a perpetual student myself, I wanted to know which astrologer did the best . . . Readers will come to their own conclusions about which astrologer was most on target, but for me, the clearest, most consistently accurate statements were given by Steven Forrest.” I am profoundly proud of that review. It was such a vindication for Evolutionary Astrology. And it feels good to know that we have published the likes of Rob Hand, Demetra George and Robert Schmidt, for whom I have great respect - really, all of the astrologers in that project are admirable and I am honored to call them colleagues. Beyond Seven Paws Press, we represent some software and we sell CDs of our lectures, computerized reports, a few videos, and various minor services. It’s all up there on our web site, www.sevenpawspress.com. Erlewine In particular, how about the story of any astrology businesses you have undertaken, the ups and downs, and your view of the future of this work? Forrest: All in all, I would say that the businesses I just described play a critical role in my work. None of them are all that lucrative individually, but there is a synergy created by their interactions. For me personally, both the money and the soul in astrology lie with the “holy trinity” of client work, teaching and serious writing. Jodie is somewhat less inclined by nature toward the client work than I am and so she hasn’t developed that side of things to the same extent as I have, although she does work with clients herself. Instead, she has taken over the development of everything else. She’s been brilliant and indefatigable about all that, and I am profoundly grateful to her for it. She has met her own needs, but in so doing she has also provided a wonderful support for me in terms of keeping my lectures available, running the web site, giving us credit card support, and most importantly, providing me with a publisher who isn’t startled and confused by my occasional polysyllabic word! Erlewine How have astrologers responded to your site and what about regular folks? Forrest: Last I heard, we were getting about 16,000 visitors per month to www.sevenpawspress.com (which is the same as www.stevenforrest.com and www.jodieforrest.com, by the way). That seems respectable for our purposes. We never aimed to run a “big” commercial website like Astrology.com, Tarot.com or even StarIQ.com. Ours is really more of a “brochure” for the work we do and the products we sell, with a little bit of fun thrown into the mix. Statistically, there are two main attractions in our web site. The first is our listing of state-by-state sources for birth certificates. And second, curiously enough, is Jodie’s and my interpretations of the Norse Runes! We wrote those during the time we were so active in the neo-Pagan movement due to Jodie’s “Rhymer and the Ravens” trilogy and the rock operas we did based on those books. (See www.MySpace.com/dragonshipmusic) We put the Rune interpretations up on the website as a lark, and were shocked to see how they caught fire! It was a real reminder of how tiny the world of serious astrology is, comparatively speaking. Erlewine Do you think astrology is a predictive tool and if so, how so? Forrest: Astrology is excellent at predicting the nature and the timing of life’s questions. It predicts “answers” pretty well for the brain-dead, but once a person has begun to exercise the potentials of consciousness, he or she leaves the depressing world where the future already exists and enters a much more multi-dimensional, quantum framework of possibility. I rarely get exercised about technical differences among astrologers, but I have actually come to believe that “making predictions” for people is an insidious, even immoral activity. I say it that strongly because such predictions can interfere with people’s higher purposes and possibilities, and doing that is truly dark magic. In Evolutionary Astrology, we are coaches, not prophets. This view of mine would apply only to the personal, development kinds of astrology, by the way, not to predicting the future of the stock market or the result of a baseball game. Erlewine Do you identify yourself as an astrologer to others and how do they respond? Forrest: I do, now. When I was younger and less secure in my identity, I learned to dodge the subject for fear of the censorious responses I would get. Now I am easy with the role, and I find that my ease seems to have translated into easier responses on the parts of others. Generally I get interest and curiosity. I think it is pretty obvious that I am not a stupid person and folks seem to have to stretch for any other explanation of my belief in astrology! Erlewine Does astrology give you answers for deeply personal questions and quests? Forrest: That is a really hard question. Thank you for it. The short answer is simply “Yes.” The long answer is that everyone, no matter how agnostic, brings their own personal philosophy and beliefs to astrology. It is impossible really to do totally “values-free, non-judgmental, neutral” astrology – since even being values-free, non-judgmental, and neutral IS a philosophy! For me, astrology has become inextricably woven into a particular world view. I am formally Buddhist now, although I have basically been on that path since I was about nineteen. I was raised in a healthy Christian context and still have Christian feelings, which I actually find quite easy to reconcile with Buddhism at the heart level. I believe that we are mysterious beings evolving over many lifetimes in a profoundly mysterious world, and that we are returning to something beyond description that we might as well call God. I believe that everything that happens to us in life, everything we face outwardly, every pain or psychic discomfort we experience inwardly, is part of that long journey home. I cannot prove any of this, but I can lay my cards on the table honestly and transparently. That view of life suffuses my style of astrology. That is what the planets reflect back to me. And thus astrology feeds back quite meaningfully into my “deeply personal questions and quests.” It eloquently addresses my own journey home.